Thanks to the Schwan’s man, I had a carton of Summer’s Dream languishing in my freezer. If you haven’t tried it yet, it is pretty yummy. They blend vanilla ice cream with orange sherbet and package it frozen under the title of Summer’s Dream. I decided to try whip up a pie using a recipe in the Schwan’s catalog as a starting point. I tweaked it just a bit and ended up with a delicious pie that even Captain Cavedweller liked (which is really saying something!). It was very simple and easy to make. Having the patience to wait until it was frozen and ready to eat was the biggest challenge. 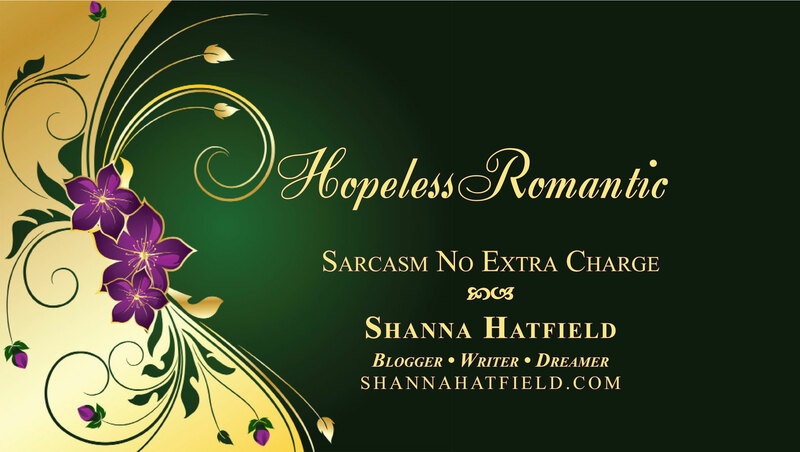 Especially for those of us who are patience-challenged. 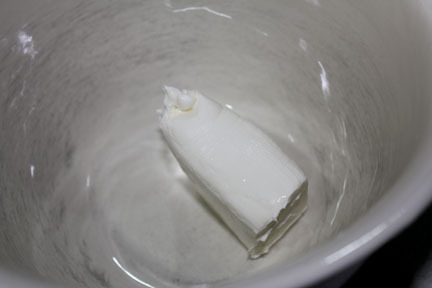 Scoop softened Summer's Dream into your prepared pie crust, just covering the bottom and sides. Drain Mandarian Oranges. Captain Cavedweller likes to drink the juice and then I don't feel like I've just poured something delicious down the sink. 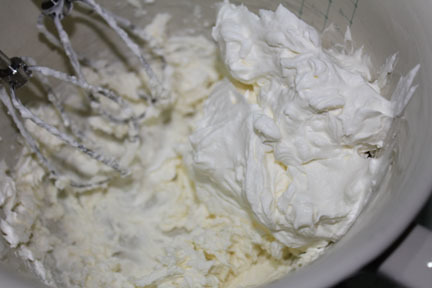 Scoop Summer's Dream into cream cheese and whipped cream mixture. Add in Mandarin oranges and blend together. I skipped a few steps here as the ice cream was melting way too fast in our hot house. 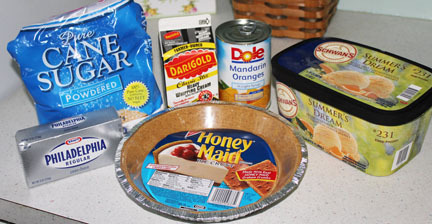 Pour mix into pie pan. Freeze for three hours (or longer) and garnish with whipped cream, Mandarin oranges and a sprig of mint if you want to get all fancy-pants. Which I did. And it was yummy. Substitution Note: If you don’t have a Schwan’s man who brings deliciousness to your door, you can easily mix three cups of vanilla ice cream with three cups of orange sherbet. If you don’t feel like making fresh whipped cream, a tub of frozen whipped topping works just as well. If you aren’t a lazy slug like me, you can mix crushed graham crackers, a spoon of sugar and melted butter to make the crust. 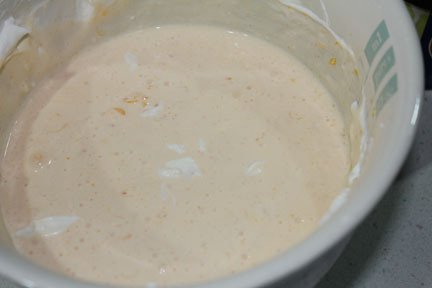 Pat into a pan and refrigerate 30 minutes before pouring in the filling. While ice cream is softening, drain the oranges and set aside. If you buy a small package of cream cheese, use it all. If you are cutting a large package in half, use three ounces. Beat it until it is light and fluffy then add in whipped cream. 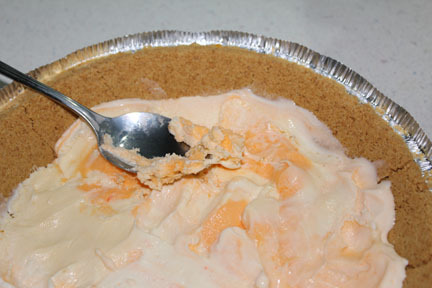 Spoon softened ice cream into crust. Use just enough to cover the bottom and up the sides – probably about 1 1/2 cups. 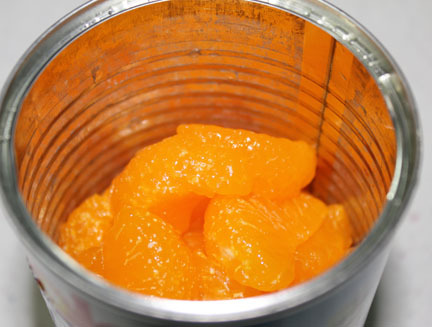 Scoop the remaining 3 1/2 cups into the cream cheese mixture along with the can of oranges. (Reserve a few orange slices for garnish, if you wish). Pour into the crust and freeze for three hours. 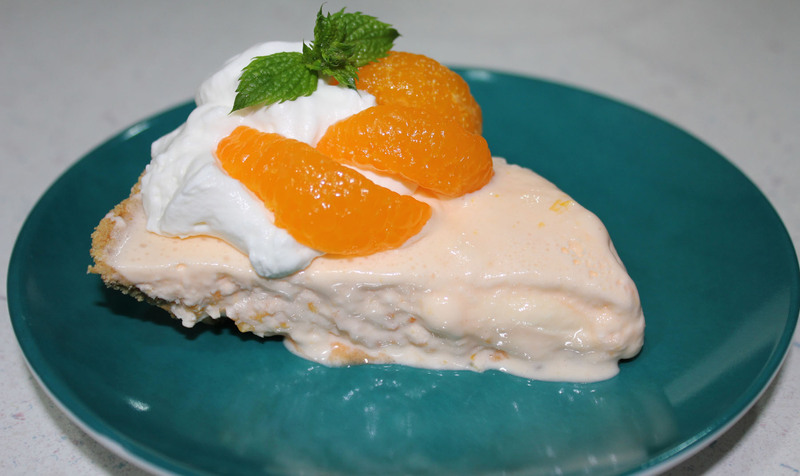 Remove from freezer, slice and serve with a dollop of whipped cream and an orange slice for garnish.